The European Commission has just published its winter 2018 interim forecast (European Commission 2018). This column puts the near-term economic outlook for the euro area in its broader context and attempts to derive guidance for economic policy. GDP growth continued to be strong in the second half of 2017, leading to positive forecast revisions by institutional and private-sector forecasters alike. Yet, the outlook for underlying inflation remains subdued once one abstracts from the temporary influence of energy prices. Did the crisis cause scars or scratches? Which factors of the 'atypical' recovery will remain relevant? How fit will the economy become? How fast and how far can GDP grow before supply-side constraints become binding? When will core inflation pick up for good? The answer to these questions is key to guide the appropriate policy stance going forward. The recovery that started in the second quarter of 2013 has been exceptionally slow. This is consistent with the view that recoveries from deep economic and financial crisis are generally held back by protracted balance sheet adjustment and deleveraging in the private and the public sector (Reinhart and Rogoff 2014). Throughout the slow recovery, the discussion of its 'atypical' features has remained intense. Efforts to conceptualise these more broadly include the idea of secular stagnation (Summers 2015, Gordon 2015) and the discussion of hysteresis versus transitory (yet protracted) crisis legacies – “scars or scratches” in the words of Coeuré (2017) (see also Blanchard 2018). Explanations that focus on high savings and a shortfall of demand lead to a prediction of low GDP growth amid persistently very low inflation. Approaches that focus on the crisis impact on potential growth do not necessarily imply persistently low inflation, unless additional assumptions are added (e.g. the central bank is unable to accommodate the lower equilibrium real interest rate). Where does the euro area economy stand in early 2018 relative to these various post-crisis narratives? The subsequent sections discuss the crisis legacies in terms of unemployment, investment, inflation and the external balance, as well as the growth potential. On this basis, our take is that if the crisis has clearly led to a permanent fall in the level of potential output, its impact on the potential growth rate is still unclear. Although there are signs that, in line with Coeuré's conclusion, the crisis "may have caused scratches, but not necessarily scars", a risk of hysteresis – i.e. scars – remains. At the same time, labour market slack that is larger than suggested by the headline unemployment rate (more below) shows that there is scope for solid growth to continue for some time before wages and price pressures accelerate and become self-sustained. And the recovery in investment, as well as a possible cyclical increase of productivity growth, could not only have a positive effect on actual growth but could also modestly increase long-run potential growth. The most debilitating crisis legacies are gradually fading (Figure 1). Total investment as a share of GDP now stands at 21%, still somewhat below the level in the early 2000s. But equipment investment has recovered and is now at 6½% of GDP, slightly higher than in the early 2000s. 'Other investment', which includes intangibles, has increased as a share of GDP over the past decade without being much affected by the crisis. It's the share of construction in GDP that remains more subdued – at 10% of GDP against an average of 12½% in 2000-2005, reflecting reduced public infrastructure investment and the drawn-out adjustment in the residential construction sector following the housing boom and bust. Notes: The methodology used for calculating the current account norm is akin to that followed by the IMF’s External Balance Assessment (Philips et al. 2013). The main differences consist of a larger sample, a slightly different empirical specification, and some differences in the definition of norms. Source: Eurostat, AMECO, own calculations. Debt levels in the public and private sectors (Figure 2) are still elevated, but they are now acting less as a drag on the cyclical expansion. Until recently, deleveraging had progressed laboriously, weighing on demand. The faster GDP growth offers the opportunity of 'passive' deleveraging through the denominator (Priftis and Theofilakou 2018). Employment growth has been quite robust in recent years, even as GDP growth was rather modest (ECB 2016). The rapid pace of job creation – the euro area now counts 7 million more jobs than in 2013 (and 1.7 million more than in 2008) – has been a major factor raising aggregate disposable incomes and underpinning the steady expansion of private consumption. It has also led to a rapid reduction in headline unemployment. The unemployment rate in the euro area now stands at 8.7%, still above its pre-crisis level but not worse than in 2004. Firms increasingly report difficulties in finding skilled workers. The share of firms in the euro area industry survey that report labour as a constraint to production has increased from below 5% in 2013 to 16% in early 2018. However, there is still slack in the labour market. In the near term, there is scope for expanding hours and participation. In fact, the number of part-time workers who would prefer to work longer hours remains elevated, and so does the number of those workers marginally attached to the labour force. In the second quarter of 2017, underemployment (persons seeking work but not immediately available, not seeking but available and underemployed part-time workers) represented 10.2% of the labour force against 7.8% in early 2008. In sum, the crisis legacies on the demand side look persistent but not permanent in the sense of strict hysteresis. There is still slack in the labour market and subdued investment, but their extent is falling. By contrast, no meaningful progress can be reported on the excess of savings over investment which is at the heart of the euro area's current account surplus. Wage growth and inflation are still low. Importantly, the normalisation of inflation remains policy-dependent. On the positive side, barring exogenous shocks or policy mistakes, this expansion at a solid but temperate speed might continue for quite some time given the positive sentiment, remaining slack, and the policy support that is still being provided. The next section discusses this further by focusing on how this 'expansion with a qualifier', as one might call it, interacts with the supply side. Can the euro area economy continue growing at recent rates now that most estimates suggest the output gap is small or already closed? Or is an inflection and convergence towards potential growth inevitable as supply constraints become binding? An answer to this question would require not only locating the supply constraints, which is subject to well-known uncertainties surrounding the assessment of slack in real time, it also requires taking into account the possible endogeneity of supply.2 This necessitates further research; for the purpose of this column, a few qualitative remarks underpinned by visual evidence will have to suffice. A look at past business cycles in the euro area confirms that GDP growth since 2013Q2 has been particularly slow (Figure 3). The fastest expansion in the past four decades was the one starting in 1975, but it was over after only five years. The shortest one was the aborted recovery starting in 2009 (not displayed). Finally, the quite similar cycles starting in 1982 and 1993 were faster, but not spectacularly so. By 1987 and 1998, respectively (i.e. five years after the trough), GDP had grown by a cumulated 3 percentage points more than it is projected to have grown by 2018 in the current expansion. More importantly, these were also expansions that lasted very long: 43 quarters to the cyclical peak from 1982 and 61 quarters for the expansion starting in 1993.3 Another interesting reference is the comparison of the recovery that started in 2013 in the euro area and the one that started in the US in 2009 (dashed line). Overall, the comparisons suggest that there is likely to be a trade-off between a temperate and sustained expansion versus a faster and shorter one. Next, trend and cyclical drivers of potential growth need to be distinguished. 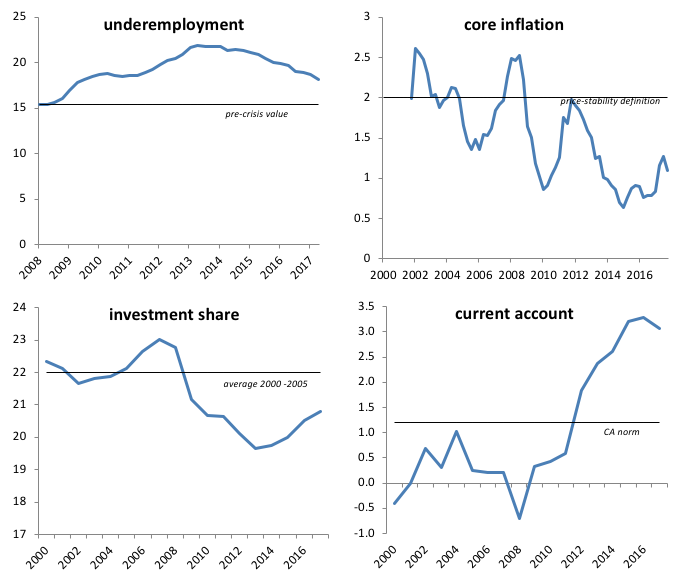 Potential growth in the euro area took a severe hit during the crisis (Table 1). It fell from 2% in the decade before the crisis to just ½% in 2013. Among the clearly crisis-related factors are the investment shortfall that reduced the capital contribution to potential output, and the increase of the NAWRU that depressed the labour contribution as unemployed workers struggled to move from declining sectors to sectors with better employment prospects. However, structural factors are also at play. The NAWRU has decreased from its crisis peaks, reflecting an improvement in the functioning of the labour market brought about by reforms in the most affected member states. On the other hand, the labour contribution is subject to a trend decline due to population ageing. Finally, total factor productivity (TFP) growth was on a trend decline already before the crisis. The drivers of this trend are subject of heated debate.4 TFP, however, also reacted strongly to the crisis, largely in association with capacity utilisation. As production capacities fell idle, TFP growth in the euro area dropped to around 0.4% at the height of the crisis. By now, capacity utilisation is well above its long-term average again, and TFP growth is estimated to have recovered to 0.6% in 2017. A positive structural impact of the crisis on productivity growth could be related to Schumpeterian creative destruction that is found to have increased allocative efficiency as the least productive firms have dropped out of the market during the crisis (Gamberoni et al. 2016). Since the start of the recovery, the impact of the crisis on potential growth has been reversed to a great extent, bringing its estimated rate to 1½% in 2018. As employment and investment continue to recover, there could be some leeway for the labour and capital contributions to increase further. In contrast to the US, labour force participation in the euro area did not drop during the crisis. But slack in terms of hours worked, the hidden labour force, and long-term unemployment is still substantial and at risk of becoming structurally entrenched. The investment recovery so far has had a very small impact on the capital contribution (not visible in Table 1 due to rounding). A further recovery of the investment share could increase the capital contribution somewhat more. While the share of equipment investment has already recovered, both replacement investment and investment to expand production capacity may have a positive impact on productivity as newer technologies are incorporated into the capital stock. Turning to the cyclical pattern of TFP growth, the already high rate of capacity utilisation suggests that it has probably not much further to increase. Taken together, these elements suggest that the risk of a vicious cycle where pessimism about future demand would reduce investment and thereby potential growth has been overcome. There is even the possibility of a virtuous cycle where realised growth modestly increases potential. In conclusion, some past recoveries that were not very brisk lasted quite long. Actual GDP growth continued to outpace potential for some years after the closure of the output gap. At the current juncture, considering also the remaining slack, relatively temperate growth as it is projected in the Commission’s winter forecast can be sustained for some time before supply constraints become binding. The recovery of potential growth from the impact of the crisis appears to have run most of the path implied by the cyclical upswing already. Investment and job creation could still expand the productive capacity a bit, but population ageing and the subdued TFP trend make pre-crisis rates of potential growth unattainable – at least in the absence of fundamental structural reforms and/or a technological leap. The risks to this positive outlook are broadly balanced. Near-term indicators suggest that the growth momentum could again surprise on the upside. This would also imply that supply constraints become binding earlier than under the forecast baseline. On the downside, recent tensions in global financial markets are a reminder that compressed risk premia and high asset valuations could correct sharply. Within the euro area, housing markets in some member states have started to look tight. Despite robust employment growth and low unemployment rates in some member states, wage growth has remained remarkably low in the euro area. Core inflation (HICP excluding energy and unprocessed food) increased somewhat from around 0.8% during most of 2016 to 1.2% in January 2018, but has not yet displayed a clear upward trend. Inflation expectations are now clearly on the rise (Figure 4). 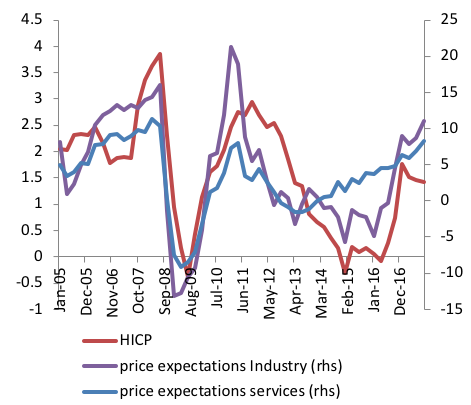 Whereas price expectations in industry show an impact of energy price volatility, it is remarkable that price expectations in the services sector, where costs largely reflect wages, have been on a quite steady upward trend since 2013. Labour productivity growth averaged 1.3% in the pre-crisis years and 0.8% since. As suggested by Figure 5, it is to some extent related to the position in the cycle (output gap). 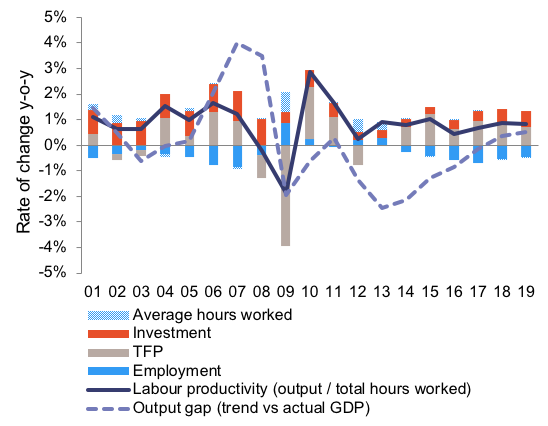 In the post-crisis years, the contribution of capital deepening to labour productivity growth has been rather small, and the strong employment performance since 2013 has mechanically reduced it further. This suggests that with an acceleration of investment and a slight reduction in the pace of job creation, labour productivity growth is set to increase moderately in the forecast years. These are promising signs for a moderate pick-up in underlying inflation. The output gap, productivity, and inflation expectations all point to an increase in wage growth and, ultimately, core inflation. Given its tempered speed, the cyclical upswing may have several years to run before fading out. Nonetheless, now is the time to remove obstacles in the way and boost potential. This is not about either continuing supportive fiscal and monetary policies or accelerating structural reforms – it's about both. The ECB has made it amply clear that monetary accommodation will be provided until inflation is on a self-sustained path towards the ECB's definition of price stability. This should also help prevent unemployment from becoming structural (i.e. avoiding hysteresis), and by facilitating the financing of productive investment it might also have a positive, even if small, impact on potential growth. A broadly neutral fiscal stance remains appropriate for the euro area, but needs to be appropriately differentiated across member states. High-debt countries need to build buffers to put debt on a declining path even under less benign macroeconomic conditions, while those with fiscal space should continue to increase investment. Both revenues and expenditure should be oriented in such a way to favour equitable and sustainable growth. But getting fitter requires continued exercise. An accommodative macroeconomic policy stance does not in any way diminish the need for structural policies aiming specifically at increasing the rate of GDP growth that is sustainable in the medium term by raising productivity. No expansion lasts forever, and it is necessary to start preparing for the next cyclical downturn while conditions are favourable. The approach of implementing reforms mainly as 'ultima ratio' that was prominent during the crisis needs to be overcome. Also in view of the risks around the benign outlook, now is the time for strengthening resilience to worsening general economic conditions as well as asymmetric shocks. Country-specific risks of overheating and misallocation have to be addressed by the member states concerned, for example through macroprudential and tax policies. All this needs to be complemented by strengthening the euro area's capacity to handle future shocks. Blanchard, O (2018), “Should We Reject the Natural Rate Hypothesis?”, Journal of Economic Perspectives 32(1): 97-120. 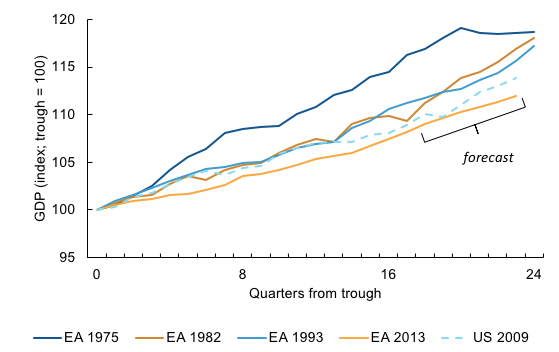 Buti, M, J Leandro and K Berti (2017), “An unusual recovery: Charting the way forward for European policymakers”, VoxEU.org, 12 May. Coeuré, B (2017), “Scars or scratches? Hysteresis in the euro area”, Speech at the International Center for Monetary and Banking Studies, Geneva, 19 May. ECB (2016), “The employment-GDP relationship since the crisis”, Economic Bulletin 6/2016. European Commission (2017), “European Economic Autumn 2017 Forecast”, DG Economic and Financial Affairs Institutional Paper 063. European Commission (2018), “European Economic Winter 2018 Interim Forecast”, DG Economic and Financial Affairs Institutional Paper 073. Gamberoni, E, C Giordano and P Lopez-Garcia (2016), “Capital and labour (mis)allocation in the euro area: some stylized facts and determinants”, Banca d'Italia Questioni di Economia e Finanza (Occasional papers) 349. Gordon, R (2015), “Secular Stagnation: A Supply-Side View”, American Economic Review, Papers and Proceedings 105(5): 54-59. Haldane, A (2017), “Productivity puzzles”, speech given at the London School of Economics, 20 March. IMF (2017), World Economic Outlook October 2017, Chapter 2. Phillips, S, L Catão, L Ricci, R Bems, M Das, J Di Giovanni, D F Unsal, M Castillo, J Lee, J Rodriguez and M Vargas (2013), "The External Balance Assessment (EBA) Methodology", IMF Working Paper 13/272. Priftis, R and A Theofilakou (2018), “Growth Effects of Corporate Balance Sheet Adjustments in the EU: An Econometric and Model-based Assessment”, DG Economic and Financial Affairs Discussion Paper, forthcoming. Reinhart C and K Rogoff (2014), “Recovery from Financial Crises: Evidence from 100 Episodes”, American Economic Review 104(5): 50-55. Rudebusch, G and J Williams (2016), “A wedge in the dual mandate: Monetary policy and long-term unemployment”, Journal of Macroeconomics 47(A): 5-18. Summers, L (2014), “Reflections on the 'New Secular Stagnation Hypothesis”, in C Teulings and R Baldwin (eds), Secular Stagnation: Facts, Causes and Cures, A VoxEU.org eBook, pp. 27-40. ESTAT (http://ec.europa.eu/eurostat/cache/bcc/bcc.html). In the Autumn 2016 European Economic Forecast, we had looked at GDP volume and the persistence of crisis legacies and concluded that it was too early to declare the recovery phase completed. On the idea that actual growth affects potential growth and its implications, see for example Coeuré (2017), Rudebusch and Williams (2016), Blanchard (2018). For the US, the NBER marks a recession in 2001, but CEPR has not identified any in that year for the euro area. Otherwise, that expansion would have lasted for 29 quarters. For an overview, see Haldane (2017).